Upon graduating from high school in 1958, Ed knew he wanted a college education; however, the nearest college was more than 50 miles from Palatka, and attending a four-year college immediately after high school would have been impossible. “It would have been a big step for me financially,” he said. 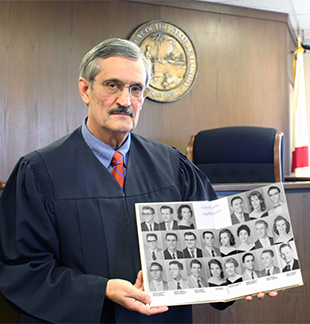 Sixty years ago, Ed's college classmates knew him as an outgoing student and class president; today we know him as Putnam County Circuit Court Judge Ed Hedstrom. The College was established that year along with five other community colleges throughout the state and began its first academic year with 12 faculty members and free bus transportation for Clay and St. Johns County students. The cost to register full time for one semester was $52.50. Shirley (Ussery) Buck remembers the registration process well. Not only did she work part time in the registrar's office, she was also the first student to register for classes at St. Johns River Junior College. "I was number one on the roster," Buck said. "I remember many of my high school classmates also enrolling at the College," she said. “It was an exciting time.” Buck said she wasn’t ready for a major university, and St. Johns provided an affordable education and the opportunity to apply for scholarships. 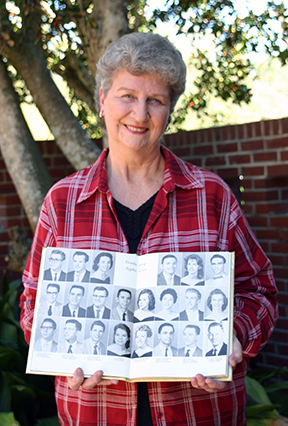 In 1960, Buck and Hedstrom were among the 22 students who were the first to graduate from St. Johns River Junior College, and not only was Buck the first student on the college roster, she was also SJRJC's first valedictorian. Buck continued her education at Florida State University and retired as the finance director of the Putnam County School System after 32 years of service. Hedstrom continued his education at the University of Florida, earning a Juris Doctor degree. The other 20 graduates were: Tommy Barnawell, Bob Beacham, Willie Brothers, Gerald Gibson, George Hedrick, Evelyn Hewett, Dale Jeffries, Shirley Johnson, David Kline, Joyce Kline, Phyllis La Follette, Ruthann Neary, Robert Penouilth, Jessica Ritter, Jerome Ridaught, Jane Swilley, Milton Starnes, Marcus Sheppard, James Thompson and Eugene Wood. The College would later change its name to St. Johns River Community College in 1977. In 2010, the College expanded its mission to offer bachelor's degrees and changed its name to St. Johns River State College. Today, SJR State continued to expand its educational opportunities with the Florida School of the Arts and campuses in St. Johns and Clay counties. This story was previously published in 2008 as part of the College's 50th Anniversary.